I just watched Eclipse last night. Yeah, yeah; I know I am late. But I am not a fan of the franchise to begin with, so I didn't really care whether I watch it when it first released or at a much later stage. Unlike most people I know, I didn't watch the first installment in a cinema. I didn't have any intention either of getting a DVD to watch it. As I've said, I was not a fan of the franchise. I heard the book was good but I stopped reading fiction a long, long time ago. So yeah, anyways, I accidentally watched the first one on HBO and there were two things that struck me: 1. the dialogues were superb (kudos to the screenwriter) and 2. the casting of Bella was perfect. It was, surprisingly, good. My Small Baby has always been intrigues by vampires and we thought that, for a movie addressing the tweens, it was actually a decent movie. I didn't and still don't care much about the whole premise of the movie but as I've said, I love the script writing and Kristin Stewart was superb. In fact, she was the one that made the movie enjoyable for me. Speaking of Kristin Stewart's talents, I first blogged about her two years ago when I saw her in Into The Wild, a movie directed by my favorite actor. I was blown away by her acting then, I am still greatly impressed with her portrayal of the heroine in Twilight. I think they got the perfect person for that crucial role; I don't think any of the current young actress could portray the role as passionate and as effective as Kristin Stewart. Personally, and My Small Baby is with me on this one, I preferred this over the second one. Oh, it's still very teenage drama-ish for my taste but the dialogue again was superb. It's not as intense and good as the first but it was so much better than the 2nd one. I actually like what is written in this picture. After all said and done, would I watch the next installment? I think I would but only because of Kristin Stewart. "I’m not saying you don’t love him. I’m not stupid. 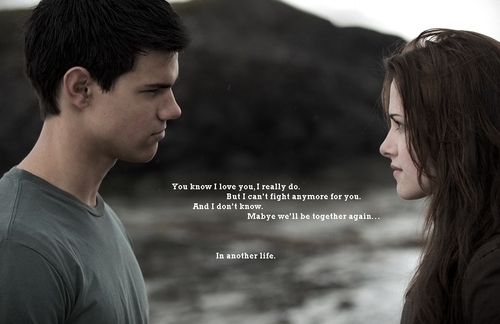 But it’s possible to love more than one person at a time, Bella. I’ve seen it in action." "I miss you every day, Bella. It’s not the same without you." "The clouds I can handle. But I can't fight with an eclipse."